Monday through Friday, and open through lunchtime. We heard you and we are here for you. Delta Physician Billing, customer service is our number one priority. Our Physician Billing department staff consists of several billing specialists and certified medical coders who will be available to answer all of your billing questions. Our billers and coders are knowledgeable, friendly, and willing to help you understand the billing statements you receive. Our goal is to bring you top-notch customer service by having our billers and coders available for you. Our main office is located in Delta County Memorial Hospital -Oncology Building. Our hours of operation are 7:30 a.m. to 4:00 p.m. (Open through the lunch hour). Please stop by or feel free to call us at (970) 874-2470 with any billing questions you may have. Some of our clinic locations have coders on site that are able to assist you as well. We are here to help with questions about Reventics (DCMH ER& Radiology Group), Athena (Physician Billing), AR Services, A1 Collections and facility billing. If we are unable to answer your questions at that time, we will research it, find a solution, and call you back with the information in a timely manner (within 24 hours). For your convenience, Delta Physician Billing offers multiple payment options for balances you owe. These payment options include: automatic monthly payments, online bill pay (pay via the portal listed on your statement), payments over the phone (no checks over the phone), payments by mail, or you can stop by with your statement at any of our friendly offices to pay in person. We take all forms of payment such as cash, money orders, check, HSA payments, and major credit cards. For self-pay patients, we offer a 20% prompt pay discount for balances paid within the first 30 days of receiving your first statement. If you are unable to pay the balance in full within the first 30 days we also offer monthly payment plans that can be tailored to fit your financial budget. 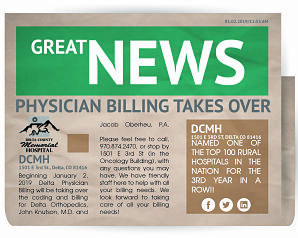 Please keep in mind that you may receive a separate billing from DCMH facility, hospitalists, ambulance services, and pathology depending on the scope of your care. Delta Physician Billing has worked hard to get our department to where we are now. We look forward to rebuilding relationships with our community in the next year, and for many years to come.